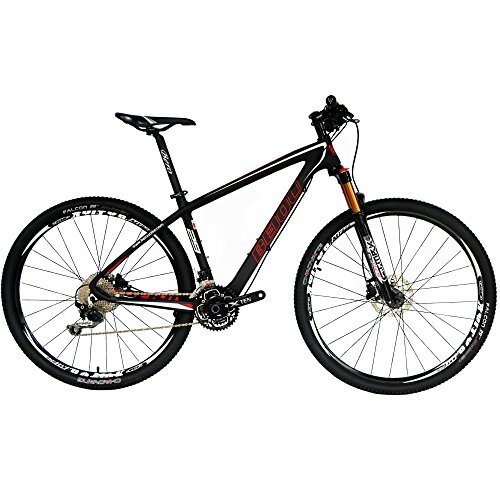 I have had many bikes, but Carbon Fiber 650B Mountain Bike is one of the bikes worth reviewing because it features the durability, the style and the speed any novice or professional athletes or any cycling enthusiast would desire. Do you remember those days you learned how to ride a bike? Was it fun? Well, it wasn’t to me. The place i live is full or rough terrains rocks and with dangers of going down the other side of the mountain if you don’t do it right or have a cheap mountain bike. Not once, has it happened to me. Where speed is a concern, nothing is important as the brake system. This is not an issue with but Carbon Fiber 650B Mountain Bike as it features a hydraulic system with Shimano M355 technology which ensures powerful and swift stopping at all times. One standout features you will notice right away is it’s lightweight and durable carbon-fiber frames. If there is one thing i have noticed about carbon fiber, is that while other kinds of metal show sign of damage, carbon doesn’t. The other good thing about it is you literally carry the mountain bike around anywhere. Speed is what makes riding fun, and that’s what this bike offers you. It features a 27-speed system utilizing Shimano Alivio gearing to help you optimize your control when riding at the top speed. Carbon Fiber 650B Mountain Bike features a matte black, white or red finish, which I am sure will match with your customized riding jersey. The handlebar and the seat post has an exceptional finish and are super light which makes it one of the affordable mountain bikes on the market. Even with such incredible strength and toughness on this bike, careless acts will definitely leave you frustrated. I mean the way you take care of the bike, the assembly and the way you ride. Over torquing is probably one of the biggest reasons why this bike will lead to crash. The only way you can avoid such problems is to do the assembly job correctly. Make sure there are no burs, no rough spots or metal shards that can cut and harm the carbon when assembling. If you haven’t been on a bike for years, then you’ve got to select the right size. Fortunately, this bike comes in different sizes, so you will definitely get your perfect fit. The Carbon Fiber 650B Mountain Bike is without any doubt a performing bike even on the most challenging trails and mountain paths. It’s one of the best mountain bikes on the market designed with top-notch technology that ensures efficiency at all times. Not so cheap, but you won’t have to break the bank. For the price, the bike is worth every penny you invest in it. So, if you are a cycling enthusiast in need of the extra power to enable you to move over those tough terrains, this bike is worth every consideration.